What would you ask of your own article writing and marketing genie? There are times when we all wish we had our own magic lamp with a genie inside to grant us wishes. The childhood story of Aladdin tells of the mystical adventure of a boy who finds an oil lamp, rubs it, and has a genie pop out who grants him three wishes. The story is designed to get us thinking about what we’d ask for if we were granted just three wishes. It can also help us reflect on our own article writing hopes, dreams and wishes. Understanding the long tail concept and how it relates to article marketing is key to understanding who your audience is and reaching them. It can help you understand exactly what type of audience you get from certain keywords and keyphrases you use to write articles. If you’ve ever studied statistics, you might remember what a long tail distribution curve looks like. It’s where the tail of the curve is extremely long compared to the head. In article writing and marketing, this distribution curve can be applied to the keywords from a niche to choose the most effective subjects to cover. There are three sections to the long tail distribution curve for keywords. The further down the curve you move, the more specific and numerous the keywords become. 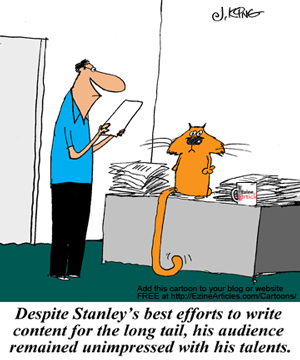 Felix made a couple mistakes during his last article writing session. Can you spot them? 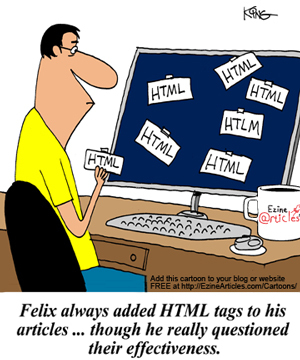 Unfortunately, Felix sometimes uses too much HTML text styling. Excessive use of the bold, italics and underline styling options can distract readers from the real meaning of the content. As more sections are made bold, each bolded section stands out less. Felix also forgot to double-check his HTML code in the WYSIWYG (“What You See Is What You Get”) submission form, so the text in the article didn’t come out quite the way he wanted. Remember that precision counts when using HTML coding, and the slightest typing error can affect the appearance of the entire article. If you choose to use HTML in your submissions, the WYSIWYG form is a great way to discover how HTML works, and it’s also a great way to check that it’s right. With these tips, gain laser-like accuracy when writing articles for your target audience. Effective writing starts with knowing your audience and communicating to them in their language. When your audience gets the sense that they are being spoken to directly, they’ll understand the message better and be more likely to consider your advice. In other words, they’ll get the sense that your article was targeted at them with laser-like accuracy. When you understand who your readers are, you come closer to connecting with them through the written word. With this connection comes trust and credibility that’ll have the audience continually coming back to you for more. Here are 3 tips for writing laser-targeted articles for your audience. Know the knowledge level of your audience. This level dictates the amount of industry lingo and detailed information allowable in an article. Keep in mind that the information included in each article will make it uniquely suitable for a specific audience. Including more advanced information might mean the average reader will have a hard time understanding the content. However, the industry experts in your niche may find a lot of value in this content. If you write more general content, the industry experts will be bored, but the general public will be more likely to understand the content. To take advantage of this fact, write for your ideal audience. So you think you’re funny, huh? Well it’s time to prove it! 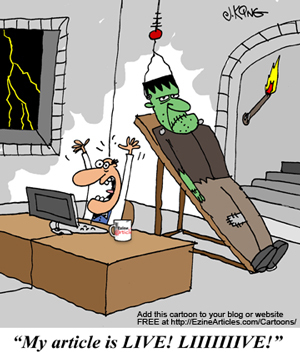 We need your help in coming up with the perfect caption for this cartoon. Submit a funny EzineArticles-related caption via the “Comments” below or on our Facebook Fan Page. In one week we’ll pick the one that makes us laugh the hardest. If we select yours, you’ll not only receive honor and appreciation from the EzineArticles community, you’ll also receive an EzineArticles cartoon mug with this cartoon (and your caption) on it! 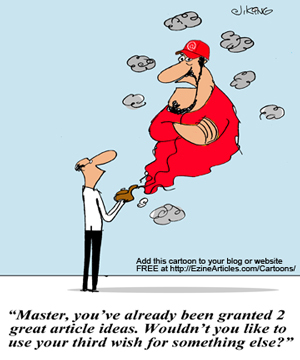 Plus, we might use your captioned cartoon in a future Blog entry. 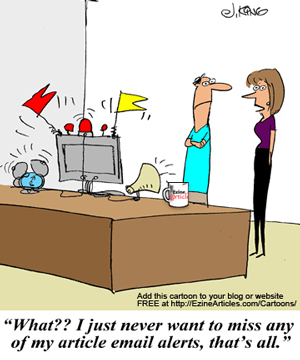 So take a well-deserved break, get your thinking cap on and submit your best EzineArticles-related caption(s). People love to laugh. So when you’re done sending us your caption, why not weave a little humor into your next set of original articles? Your readers will appreciate the breath of fresh air. This contest has ended. Click here to view a list of the winners. Your Article Goes Live! Now What? Bringing your articles to life on the Internet is a great way to drive highly-targeted traffic back to your site while increasing your credibility and media exposure at the same time – but you can do even more. In this Blog and elsewhere, we talk a lot about the process of researching, developing, writing and submitting your articles. Once your new articles are published, they usually take on a life of their own and will go to work for you almost immediately. That’s the real beauty and simplicity of article marketing: you need only sign up and then write and submit articles – we’ll take care of the rest (things like automated tweets and RSS feeds). However, some Expert Authors want more from their articles. They want their articles to be more than a creative outlet or an adjunct to their other marketing efforts. They want their articles to be part of a living, breathing, article marketing machine. For these members, article writing and marketing is an ongoing process, not a series of stand-alone events. They see it as a repeating cycle of writing, submitting, promoting and analyzing their articles to produce truly extraordinary results. 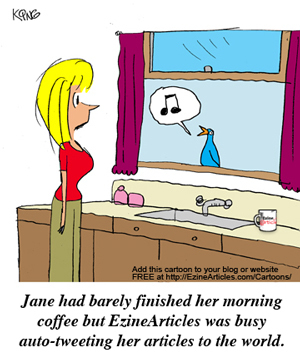 Find out right away when fresh articles have been published on EzineArticles by signing up for email alerts. Every day, we publish great content for you on EzineArticles.com, whether it’s articles by the authors you want to follow, content in the categories that are most important to you, or article-publishing news, tips and advice on the EzineArticles blog. How can you stay up to date on all of this fresh content? Easy! Just sign up for email alerts and you’ll get a new notice in your inbox whenever something in your interest areas is posted. Newly Published Articles by Your Chosen Authors: Use the email blank at the top of your chosen Expert Author’s page. See this example on Expert Author Christopher Knight’s author page. You’ll get an email alert whenever your authors publish articles. Newly Published Articles in Your Chosen Categories: Go to the official EzineArticles subscription page, and select all the content categories that interest you. Fill in your name and email in the blanks at the bottom of the page, and click the big red “Subscribe” button. Be sure to click the link in the confirmation email that will arrive almost immediately in your inbox. You’ll receive an email alert on any day when articles are published in your categories. New EzineArticles Blog Posts: Whenever a new post goes live on the EzineArticles Blog, you’ll receive a Blog Update with the post title, a summary of the post and a link to the full entry on the blog. Sign up using the blank at the top of the Blog or on the Blog Subscription page. New EzineArticles Newsletters: Sign up on the subscription page to receive this periodical newsletter for news, tips and advice to help you achieve more article-marketing success. If you haven’t had a chance to check out email alerts yet, take a minute and sign up for some today, then come back and tell us what looked most interesting. Are we missing any topics that you’d like to get alerted about? Let us know! You’ve probably noticed that this cartoon has no caption. We need your help in coming up with the perfect one. Submit a funny EzineArticles-related caption via the “Comments” below or on our Facebook Fan Page. In one week we’ll pick the one that makes us laugh the hardest. 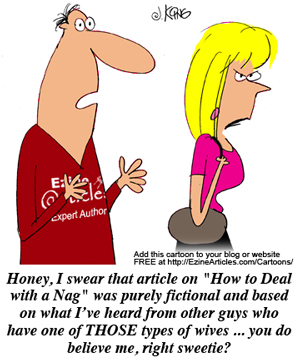 If yours is selected, you’ll not only receive the accolades and adulation of the EzineArticles community, you’ll also receive an EzineArticles cartoon mug with this cartoon (and your caption) on it! 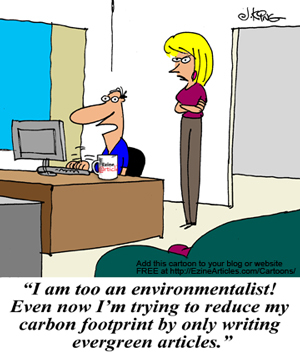 Plus, we might use your captioned cartoon in a future blog entry. So take a well-deserved break, get your thinking cap on and submit your best EzineArticles-related caption(s). 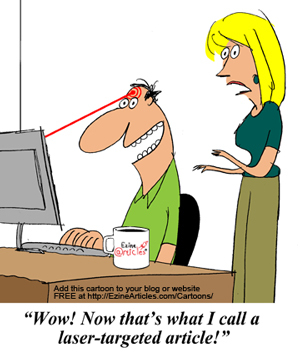 Maybe you’ll become the proud owner of an EzineArticles cartoon mug highlighting your unique sense of humor! Go green (evergreen, that is!) to increase the useful life expectancy of your articles! Writing a regular stream of fresh articles is important to your article marketing success. However, it’s important to make your articles as “evergreen” as possible with content that stays fresh, useful and informative long after you publish it. Being sensitive to how your articles will read in the coming years will help keep them from eventually becoming a stale piece of irrelevant text. Publishers prefer evergreen content, too. Your articles might live for years on a publisher’s website. Evergreen content makes them useful to their readers longer, and they can spend less time pulling out stale content. Remove the Time Element – Notice how the evergreen title below drops the year reference? Be sure to remove any time-specific references in the body copy, too. Find Long-Lasting Angles on Time-Sensitive Topics – This allows you to take even topical news items or recent events and make them virtually timeless. Stale: Writing about this week’s top-ranked tennis players. Evergreen: Writing about the traits and characteristics of top-ranked tennis players and how you can incorporate their success into your own game. Use the One-Year Test – After you write your next article, read it again and imagine it’s one year later. Rewrite anything that would be outdated. Unlike most of our other challenges, this one doesn’t involve writing lots and lots of articles. Nor will it win you any shwag prizes. For this challenge, simply write a fresh article, or take one you already have in the works, and revise it to make it evergreen. Then come back and tell us about what you did by leaving a comment below. 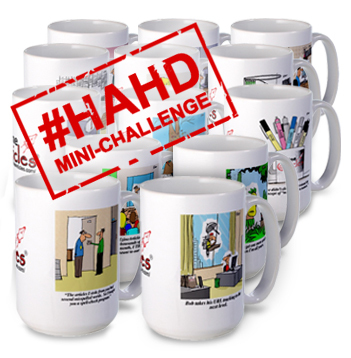 Congratulations to everyone who qualified for our most successful #HAHD Challenge ever! 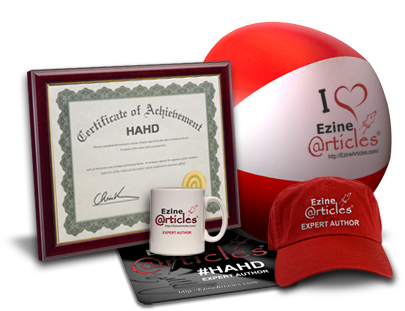 #HAHD Prize Packages – We will begin mailing the prize packages (beach ball, hat, mug, coffee and mouse pad) in the next few days. Please allow additional mailing time for locations outside of the continental U.S. Bonus Leather Coaster – To say thanks for the great participation in this challenge, we’ll be including a leather EzineArticles coaster in every prize package! Top 100 Bonus Mirror – The top 100 qualifiers with the most articles will receive an additional bonus in their prize packages as well – a ‘vintage’ EzineArticles monitor mirror! Top 100 Premium Drawing – All of the top 100 qualifiers will be placed in a random drawing to receive 1 of 10 free 1-year EzineArticles Premium Membership subscriptions valued at $582 each! Cartoon Mug Certificates – Cartoon Mug Mini-Challenge qualifiers will begin receiving their free mug certificate via email in the next few days. Cartoon Mug Drawing – One lucky Cartoon Mug Mini-Challenge qualifier will be drawn at random to receive the complete collection of all 13 EzineArticles cartoon mugs valued at nearly $170! Again, congratulations to everyone who qualified for these challenges! The 4th #HAHD Marathon Challenge begins Saturday, May 1st. Watch the Blog for more details. In the meantime, remember to continue the positive (and profitable!) habit of submitting at least one article per day to really turbocharge your article marketing success!